Find out more about the band's special Reading & Leeds warm-up show here. 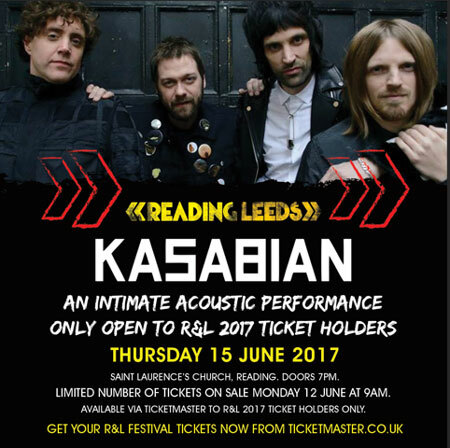 Reading & Leeds have announced a very special Kasabian gig ahead of their headline set at the twin festivals this year. The Eez-Eh rockers will appear at Saint Laurence's Church in Reading on Thursday 15 June, where they'll play a very special acoustic set. However, tickets for the St Laurence’s Church Show - which go on sale on Monday 12 June at 9am - are available exclusively to those who have tickets to Reading & Leeds 2017. Each ticket buyer will be sent a unique purchase code for a maximum of two tickets per person on a first come first served basis. Kasabian will headline Reading & Leeds festival - which takes place from 25-27 August, Bank Holiday Weeekend - alongside Muse and Eminem. Also set for the festival are the likes of Major Lazer, Haim, Bastille, Liam Gallagher, Two Door Cinema Club, At The Drive In, Migos, You Me At Six, Fatboy Slim, Halsey, Charli XCX, Glass Animals, Korn, PVRIS, Wiley and many more.